Some golfers like to keep statistics on their game. 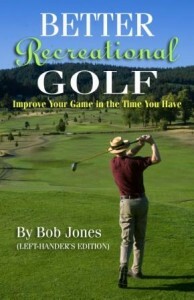 All golfers who want to improve, should. The usual stats are fairways hit, greens in regulation, up and downs, and number of putts. While these stats tell you what, they don’t tell you why. I would suggest you keep a different set of stats that are more to the point. A valuable exercise that will tell you what you really need to know about your shot-making and mental game is to evaluate every shot after the round is over. When you get home, the round should be fresh enough in your mind that you can sit down for a half-hour and make a notation about every shot, except, say, the one-foot or under tap-ins. This is a scheme I use. a. I got everything I could out of this shot. b. My head was there, but my body didn’t perform. c. I wasted a stroke because of a mental miscue. k. just making a bad stroke. Every shot gets a 1 and 2 score. The shots you aren’t satisfied with get a 3 score. While poor shot-making is sometimes related to the skills you have developed so far, much more often they are due to mental errors. Being able to fill out part 3 means you are paying attention to the way your mind operates when you play. I guarantee that you could take four shots off your game right now by playing smarter and keeping your head in the game. Pay special attention to 3j. A teaching pro told me once that almost half the swing problems he fixes involve nothing more than correcting the student’s aim. I hope your game is going well for you this year. Hopefully you are doing better than last year and are learning to be come a better ball-striker and a better player. I would nonetheless like to remind you of a few things to check on that might help you move a game that is “close” to “just right.” They are things that don’t take a lot of practice, can be learned quickly, and will yield immediate benefits. Most of this is buried in earlier posts, but rather than you having to dig it all out, here is the 2012 version of Ways to Play Better Without Practicing. 1. The prime rule of good golf is: Be at peace with the shot you’re about to hit. If you’re not completely convinced that this is the right thing to do, step away from the ball and do some more thinking about what shot you want to hit. 2. Tempo and rhythm affect every shot. Sometimes we get too quick. The way to slow yourself down is to remember at what speed you made your last swing and swing slower than that on this swing. It will come out at the same speed, most likely. a. Grip pressure – If you hit a bad shot, full swing or short shot, there is a good chance your grip pressure was too tight. Hold the club more lightly next time. b. Aim – If your aim is off, odds are you’re aimed right of your target. c. Ball position – Hogan and Nicklaus can put the ball inside their left heel for every shot, but you can’t. Put it in the center of your stance for every shot off the ground or an iron on a tee, and one ball forward of that for a driver on a tee. 4. On the course, play a shot that will put the ball in the best position for the next shot. If you can’t hit that shot, play one you can that leaves you a workable next shot. Apply this rule off the tee, off the fairway, and around the green. Another way of saying this is to play the shot you can hit, not the shot you want to hit. 5. From the fairway, figure out how far your shot is playing (actual distance to the pin, adjusted for wind, lie, elevation changes, etc.) and add five yards. Now pick your club. That plan can easily let you hit three more greens per round. 6. Strive to play well, but don’t let that become more important than making the people you’re playing with glad that they played with you. The big news in golf last week was that Dottie Pepper was named as the assistant captain of the 2013 American Solheim Cup team by captain Meg Mallon. The news is big because Pepper has been shut out of Solheim Cup captaincies because of a remark she made as a broadcaster during the 2007 Cup. Because the American press is squeamish, we don’t know if “freaking” is the exact word Pepper used. But whatever she said, it went on the air, and the roof caved in on her. Immediately after the incident she apologized sincerely and the incident should have been laid to rest. An apology wasn’t good enough for some LPGA players, though, who have carried the grudge ever since and are to this day unnamed, probably because we wouldn’t want to know who it is who lacks the maturity to forgive and forget. Pepper has been persona non grata ever since for telling the truth. Apparently she should have apologized, groveled, and begged for forgiveness, although who knows if even that would have been good enough for some people (Diaz, perhaps, who is not the warmest person you have ever met.). The mistake Pepper made was to drop her objectivity as a reporter and allow herself get caught up in the competition as if she were still in it. Reporters are observers, not participants. That’s something for her network supervisors to deal with, but she was sent to golfing Siberia in addition by members of the LPGA. Headlines in the last week’s articles refer to “Pepper’s penance,” as if this shunning was actually deserved. Or how about, “Pepper’s pardon.” Were the headline writers not suspected of getting caught up in onomatopoeia, we could laugh this off. But no, Meg Mallon gave Pepper a pardon. That, unfortunately, is exactly what had to happen. Up to now, no Solheim Cup captain has had the courage to tell to the players that Pepper is on the team, she had a 13-5-2 record in the Solheim Cup and she can teach you a helluva lot about winning, and if her presence is offensive to you, you can stay home and watch the matches on television. Pepper made her public apology right after she made her remarks. The players who led the movement against her should make theirs, too, now. Pepper deserves at least that much. The British Open will be played at Royal Lytham & St. Annes this week, for the tenth time. 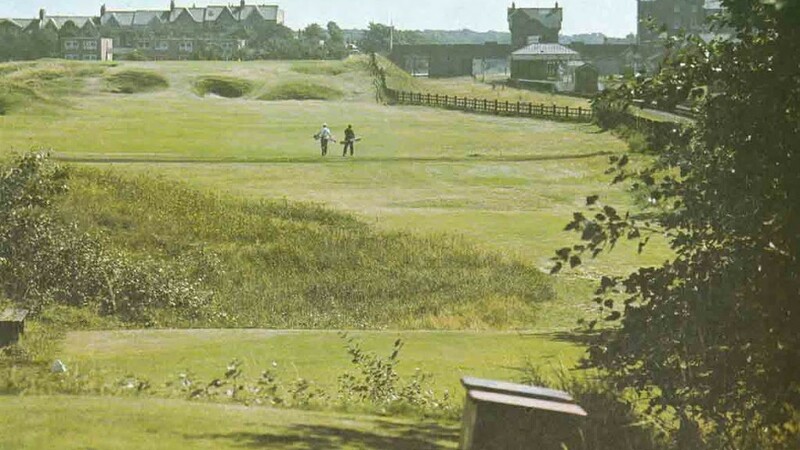 Set on the west coast of England in the city of Blackpool, the course is a blend of seaside and urban settings. The ocean is only a half mile away, so it will not be seen from the site, but winds off the Irish Sea still affect play. The course is surrounded by domestic housing and is bordered on its south side by a British Railway line. Royal Lytham & St. Annes has left behind some of the most finishes in Open history. Bobby Jones’s flawless shot from a fairway bunker on 17 in 1926 put his ball on the green inside Al Watrous’s approach. Watrous went from thinking he had Jones beaten to three-putting and handing Jones the title. A plaque now marks the spot of Jones’s shot. In 1963, Jack Nicklaus was on the 17th tee, two fours away from winning the championship. Two fives instead let Bob Charles and Phil Rogers slip into a playoff, which Charles won the next day. He was the first left-handed player ever to win a major title. Seve Ballesteros won in 1979 when he hit his drive on 16 into a temporary parking lot, but got a drop, hit onto the green and made a birdie. That saved his round in which gave him a three-stroke victory over Ben Crenshaw. The two nines are as different as two nines can be. Unlike at Olympic last month, players will be make birdies by the fistful on the front nine. They will, however, spend the next nine holes giving them all back. The course closes with six par 4s, all of them tight and most of them long. On the 15th, the hardest hole on the course, the field averaged almost a half stroke over par in 2001, and in 1974, over a full stroke over par. The first hole is a long par 3 which will be remembered as the hole on which Ian Woosnam, only a few shots off the lead in the closing round, discovered a 15th club in his bag. The two-stroke penalty ruined his chances of winning before he had holed his first putt. The tee of the eighth hole, pictured below, is the highest point on the course. The imposing cross-bunkers are about 40 yards from a green that is difficult see from the landing area in the fairway. Trees currently along the right side of the fairway now hide the evidence of the railway shown in the older picture below, detracting from the former charm of the hole. For more, see this hole-by-hole course description. 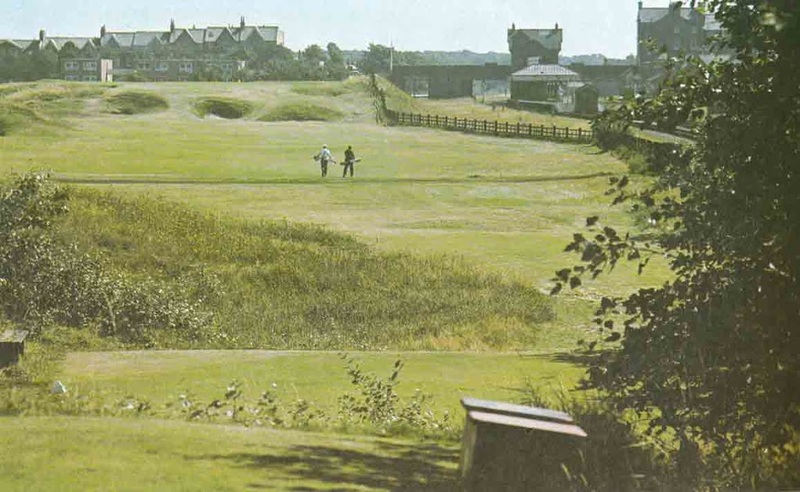 Royal Lytham & St. Annes is known for its pot bunkers (204 in total) that surround greens and landing sites in the fairway. For example, the green on the little ninth hole, 164 yards long, is surrounded by nine of them. It is because of all these bunkers that the greens are relatively free of contour. The control of roll through the fairway to avoid those bunkers makes or breaks a score. Like Olympic last month, this is a short course for a major championship. It will play at 7,110 yards. It is likely that a driver will not be needed at any time. The strategy that Tiger Woods used at Royal Liverpool in 2006, when he used a 2-iron off the tee almost exclusively, might be followed by more than a few contestants. The U.S. Open is the toughest championship, but this one I think you could say is the world championship of golf. I love the ground game British courses force you to play, I love the international flavor of this tournament, I love how to win you have to keep figuring out how to get the ball in the hole. The U. S. Open is a steak dinner. The British Open is a rich chocolate dessert. *This review was written and this pick was made before Johnson won the John Deere Classic. Plumb-Bob Putting: Does It Really Work? I have this thing about plumb-bobbing and putting. I don’t get it. Some people say it’s bunk and other golfers swear by it. They plumb-bob everything. I even saw Karie Webb plumb-bob a putt of under two feet, for cryin’ out loud. So I thought, maybe she and they are on to something. I decided to give it as fair of a test as I could. First I read all the stuff on the Internet about how it works (there doesn’t seem to be complete agreement on this point). Then I went to the range with an Acushnet Bulls Eye putter, built in the early 1960s. 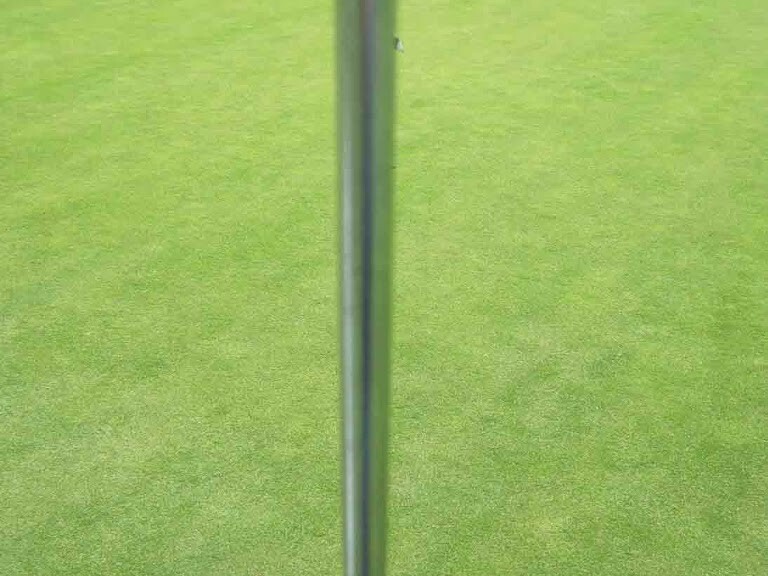 This putter has the advantage of being symmetrical from front to back, so that when it hangs down as a plumb bob it hangs down 90 degrees to the earth. Most putters to day are built asymmetrically, and do not hang straight down, which makes their use for plumb-bobbing suspect from the very start. I also took a metal track that can be used to roll a ball to determine the true contour of the green. I found a 12-foot putt with three inches of break from left to right. This is a good test putt for this experiment, because many golfers looking at it would not be certain that this putt would indeed break to the right. The idea of plumb-bobbing is that the putter would make the direction of the break clear in cases like this. I held the putter between my thumb and index finger and let it hang down. I lined up the shaft so it covered the hole and the ball. Then I closed my right (non-dominant) eye. 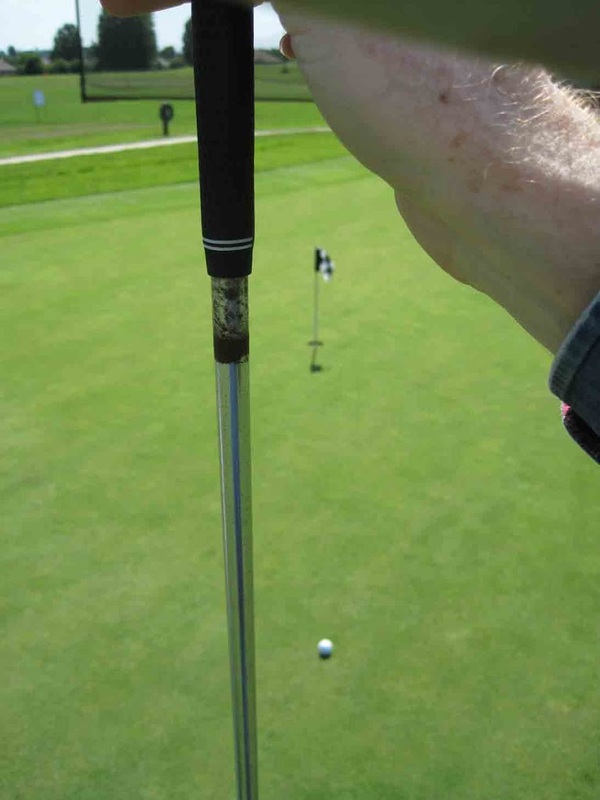 The theory of plumb-bobbing is that the hole (in this case) will appear to the right of the shaft, meaning the putt will break to the right. No go. Both the hole and the ball disappeared behind the shaft (below). I tried closing my dominant eye just to see what would happen. Both the hole and the ball appeared to the right of the shaft, which is what I expected (below). My 13-year-old grandson was with me. He tried the same procedure and he couldn’t get it to work, either. With only his dominant eye open, the shaft covered the ball and the hole. There was no indication of break. One caveat of plumb-bobbing is that it works if there is only one break in the line of the putt. When I rolled the ball down the metal track to find the direction and degree of the break, the ball rolled on a continuous curve to the right, so there was no problem on this point. So, I tried, and I couldn’t get it to work, but I’m still open to the matter. If you plumb-bob and it works, please write a comment with a detailed description of how you do it and how you interpret the visual information you get. If you were going to shoot at a target with a rifle, you would aim it at the target first. Pretty obvious. If you were going to hit a golf ball toward a target, you would aim yourself first, too. Obvious, but seldom nicely done by recreational golfers. Many times, what you think is a swing problem is really a matter of not getting aimed* when you set up for the shot. When a golfer is mis-aimed, it is almost always to the right of the target. The subconscious mind knows this, and tries to make a correction during the downswing to get the swing aimed at the target again. Correcting like this is unreliable and is a cause of shots that fly off in every direction — there’s no consistent miss. I use an intuitive method of aiming that never fails me. Step behind the ball on a line connecting the ball and the spot downrange you are aiming for. Find something on the ground about a foot in front of the ball on that line — a piece of dirt, a distinctive blade of grass, or the like. This is the aim line. Now step up to the ball and put the clubhead down behind the ball so the grooves are square to the aim line. Hold the clubhead there and turn your head to look at the target. Now comes the intuitive part. Without moving your head, and as you look at the target, step into your stance. Your feet will automatically find the places that put your stance parallel to your aim line. As you’re learning to do this, put down some sticks, one along your aim line and another against your heels, to check that your feet are indeed parallel to your aim line. The proof for me that this method works comes whenever I have a swing lesson. I step into the shot like this and the pro, standing behind me to look down the line just says one word — Perfect. Don’t be afraid to aim your short shots, too, especially the chips you think you can hole out. There’s nothing more frustrating that leaving a chip hole-high but three feet to the right because that’s where you were aimed. I like to stand behind the ball and hold out my club horizontally in front of me to find a spot on the ground in front of my ball on the aim line. Getting your feet parallel to this line is not too difficult. The real object is to swing along this line. * Aim is the direction you are set up to swing at. Alignment is the geometric relation of the lines across your feet, knees, hips, elbows, and shoulders. There are certain things you can and cannot do on the putting green. Rule 16, The Putting Green, covers only a few of them. Some of these things have been covered before in this weekly series, but here is the putting green collection of rules all in one place. Hopefully, most of it is familiar to you already. You may lift your ball after marking it and clean it if you wish to (16-1b). If the ball, after it has been replaced, moves accidentally in picking up the marker, the ball must be replaced and there is no penalty (20-3a). A ball on the green may not be touched if it is not marked – one-stroke penalty (18-2a). You may repair old hole plugs, ball marks, and damage to the green caused by the impact of the ball, but no other damage that might assist subsequent play (such as a damaged lip on the hole) (16-1c). If you play a stroke when your ball is on the putting green and your ball hits another ball that is on the putting green, you incur a two-stroke penalty. The ball you hit must be replaced, and you play your ball from where it came to rest. 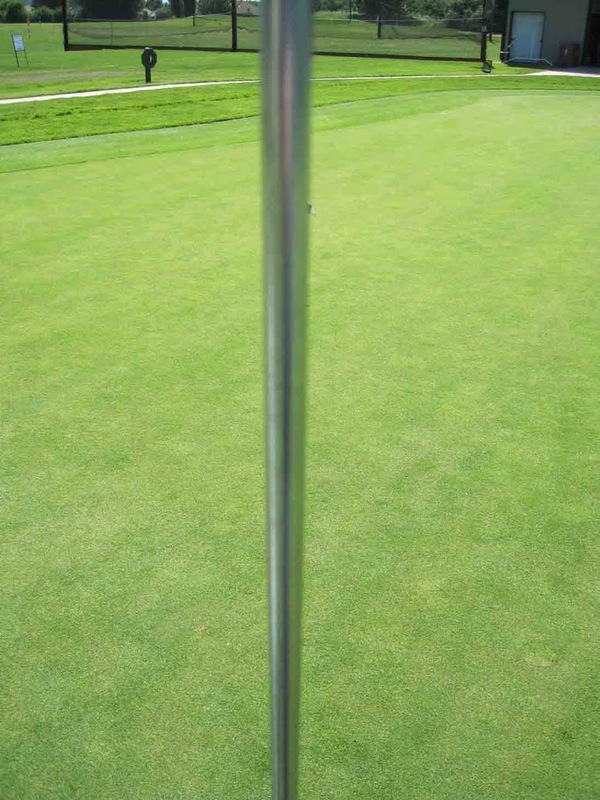 (19-5a) If your ball was not on the putting green and it hit a ball that was, proceed as before, but there is no penalty. A few weeks ago, I took a lesson on how to chip from several yards off the green. This is not where the ball is just off the edge of the green and you could poke it on with a 6-iron. The shot I need help on has to be hit with a lofted club, and that introduces spin. I wanted to learn how to hit it and get predictable spin so the shot wouldn’t check up one time and run out the next. So, the pro taught me step-by-step, and in a half hour I had it figured out. I practiced it for a while after the lesson was over, then sat in the car before I drove home to write down the points the pro gave me on how to hit it. There were six. Six things I had to do to get it right. I practiced every day after that, working on those six things, one at a time, until one or two points became one. Now only four things to work on, gradually merging the points until it became two points, then one. When it gets down to none, I’ll have it cracked. What I have been doing is not training the body, but training the mind. None of the points are difficult at all. Anyone can execute them. The hard part is to coordinate them, to do them in the proper order and not leave out any. That’s an accomplishment which occurs in the mind. When we play golf, we should just be playing. Mechanics get worked out on the range. They get worked out by training the mind to perform, not the body. Swinging the club, hitting balls without a plan, is so much exercise. If you know what you are trying to accomplish, in the sense that if you get certain points right you’ll get the shot you want, you’re working on embedding the mental instructions into your memory so they become automatic and don’t think about them. When you play, you ideally just perform so what you have trained yourself to do will come out. If you’re still worried about mechanics when you play, you haven’t completed your training yet. You haven’t spent enough time giving your mind a chance to learn what to do. I read once, in regard to learning a new language, that language learning is overlearning. Through constant repetition, habits are acquired so the speaker can to be concerned only with what to say rather than how to say it. It’s the same with golf. 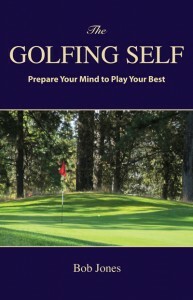 Through mentally structured practice, the mind learns how to hit a shot automatically so the golfer can be concerned with what the shot is supposed to accomplish rather than how to hit it. Let me be clear on what a new shot is. It’s not a shot you haven’t hit before. It’s any shot which you can’t hit without thinking about what to do. 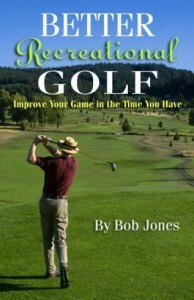 I began by describing a shot which I have hit many times on the course. Because I didn’t really know how to hit it, it was still a new shot to me. If you would adopt that attitude to your game, it will lead you to thinking the right way about developing your game and becoming a shot-maker.